← NYE Goya Dance TOMORROW! There’s still time to register for Great Escape WINTER CAMP 2018. Don’t miss out on the fun we have planned for a weekend retreat filled with fellowship, discussions, skits, olympic games, bonfires, sing-a-longs and worship to enlighten your Lenten journey. Spots are filling up fast! Limited to only 75 campers, on a first come first serve basis. CLICK HERE TO REGISTER FOR WINTER CAMP NOW! 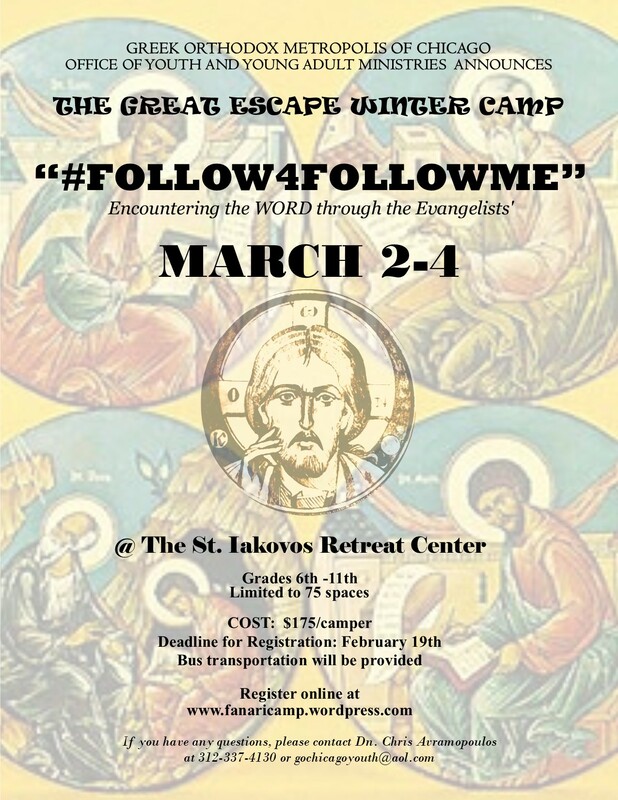 WHO: Grades 6th-11th WHEN: March 2-4 COST: $175 WHERE: St. Iakovos Retreat Center, Kansasville, WI. Registration opens, TUESDAY, MARCH 6TH AT 12:00pm at fanari.org.